William Trost Richards first established his reputation as a painter of wooded landscapes in the style of his early teacher Paul Weber. By 1858 he began a study of Pre-Raphaelitism, at first probably on his own and subsequently in conjunction with a group of painters in New York City who had begun to follow the work of the English Pre-Raphaelite movement and the writings of John Ruskin. In 1863 the Association for the Advancement of Truth in Art was formed, which included Richards as a member. They met as a group only a few times, but the movement was sustained by the publication of their journal New Path (published May 1863 to December 1865). Its most enduring legacy, however, was the pictures they produced, which gave visual form to Ruskin's insistence on "truth to nature" in their near-photographic accuracy and topographical correctness. Critical responses to Richards's work in this vein were mixed; initially they found the minute accuracy impressive, but over time they began to question a literalness that bordered on imitative. 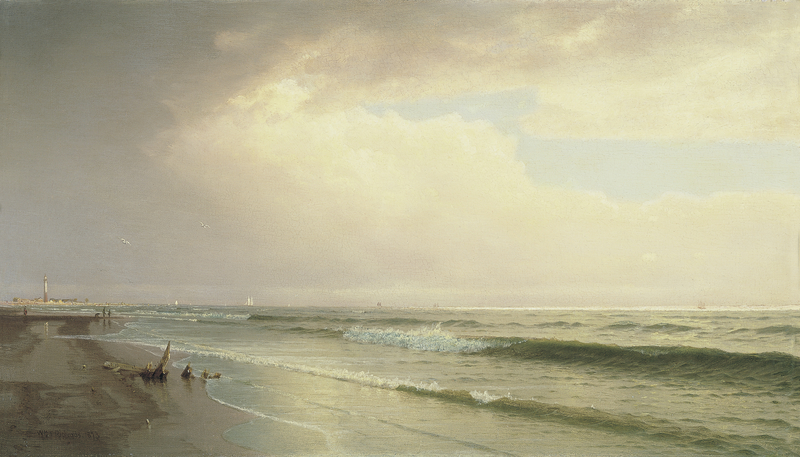 In the 1870s the coast and the sea became his new themes. Seascape with Distant Lighthouse, Atlantic City, New Jersey is an early manifestation of this love of the ocean. The similarity in conception and painterly touch between this work and James Hamilton's contemporaneous Beach at Atlantic City (Private Collection) suggest that they may have sketched together along the Jersey shore, and underscores the enduring importance for Richards of the art traditions of his native Philadelphia. Around this time also he began to experiment with other techniques, especially watercolour, and joined the American Watercolor Society in 1874. Work in this medium may have encouraged his observation of the fleeting effects of light on the water, and the breaking waves, and thus led to a loosening of his stroke. In this canvas, for example, a range of brushwork is evident, from the carefully finished passages in the open water to the more painterly treatment of the cresting waves. Seascape with Distant Lighthouse is organised around tautly drawn and measured underpinnings. All of the seascape elements -the horizon line, the frothy wave at the sand's edge, and lines of breaking waves further off shore- seem to converge upon a single vanishing point at the left, marked by the lighthouse. This deliberate linear arrangement focuses the viewer's attention on the distant form which can be identified as Absecon Light still standing in Atlantic City. Its distinctive red and white bands were painted in 1872, the year before the picture, in order to increase its effectiveness as a day-mark. The structure is of some historic importance, built in 1854 in what was then a lonely seacoast village called by the Indian name Absegame and one of the popular lights along the Eastern seaboard. 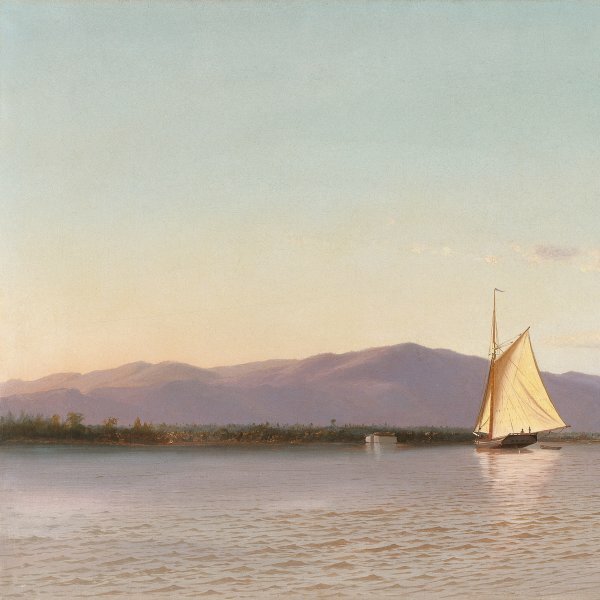 The marines Richards first began to paint in earnest in the 1870s preoccupied him for the remainder of his career. A trip to Great Britain from 1878 to 1880 afforded the opportunity to tour its changing coastline from England and the west of Ireland to the Channel Islands, where the scenery was recorded for future works. By 1881 he had returned to the United States and begun construction of Graycliff, his new house in Newport, Rhode Island. He could then observe from the windows of his own home the sea in its ever-changing moods: his unfailing source of artistic inspiration.